Our Woodbury Limo and Town Car service provides 24/7 premium NYC limo service from airport to downtown. Choose a vehicle of your choice and book your airport limo today. We offer the latest model of sedans, Stretch Limousine , SUVs and luxury vans. WHY CHOOSE I LOVE Woodbury LIMOS? Because we own a big number of limos, Our price is always cheaper than the others. Cheapest Price Guarantee!!! Friendly and Certified chauffeurs. Your mood and safety are the most important to us and our chauffeurs know that. 24/7 Support. Call us any time to get the best price or any complaints. At K and G Limousine, we believe in providing our customers with the best possible experience at every level. From the very beginning of the reservation process to the moment your trip ends, we provide transparency, clear communication, outstanding service and a deep regard for your needs and wants. From our on-time, every-time guarantee to our complete customer service availability, we feel confident that we can provide our clients with a transportation experience that is beyond comparison. K and G Limousine is a limousine service in Woodbury specializing in Airport Limos, Corporate Transportation, and Strech Limo rentals. We also offer JFK, LaGuardia transportation, shuttles and more. K and G Limousine has a full fleet of vehicles to take you to any event. Our party buses keep the party alive while our luxury cars and limos portray only the top in class and performance. With our best-in-class limo service, you are sure to have an incredible experience. Woodbury Airport Pickup Transfer Services Make a reservation for one of our Woodbury Airport limo rentals today and reserve an affordable transportation service that can provide you with on time arrival at the all major Airport of NYC and Long Island. One of the most difficult and overwhelming aspects of wedding planning is choosing the correct vendors for each service. You want to pick companies that are affordable, reliable, and have great customer service, but also companies that offer the style and luxury that will make your wedding memorable for you and your guests for years to come. 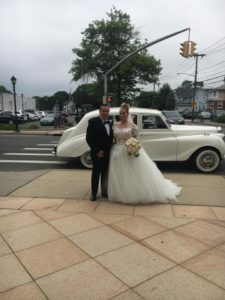 Which is why you should choose the Woodbury Limo Wedding Limo Service package as your NYC and Long Island wedding limousine service. While being prompt is always important for people using any type of car service, timeliness for a wedding is absolutely critical. One only has to imagine a poor groom waiting at the end of an aisle for a bride who has been delayed by an unprofessional car service to realize just how important being on-time is on your wedding day! Safety is another reason that K and G Limousine is your best choice on your wedding day. Wedding days are full of excitement, nervousness, anticipation, people coming from out-of-town, and, for many people, drinking quite a few adult beverages. None of these things makes for safe drivers. Trusting K and G Limousine to handle transportation for your wedding, whether simply for the bride and groom, for the entire wedding party, o r to transport guests from the wedding location to the reception, helps ensure the safety of your friends and family. Call K and G Limousine today and feel confident crossing off one more vendor on your wedding to-do list! Some of the fondest memories teenagers have are the prom nights they’ve been to. Woodbury Prom Limo aims at making prom the perfect night of your life with a private chauffeuring service. Woodbury Prom Limo makes provisions for luxurious limousines which you can hire to chauffeur your friends and your special date to the prom venue. At www.kglimo.com you can take your pick among the many limousines we have and find that special abode to make your evening extra special. At Woodbury Prom Limo, you will never run out of options. We can provide you with SUV limos, stretch and super stretch limos, classic town cars and party bus limousines on request. Arriving and leaving in style is what you want to do and with Woodbury Prom Limo Service, this is what you will get to do. Stepping out of a Woodbury Prom Limousine and stepping into one is sure to make a very impressive statement at your prom. So, go ahead and make your reservations with Woodbury Prom Limo Rental right away, so that you can use the rest of the days ahead to plan every other detail to make prom night special. As for chauffeuring you to prom and back, that’s our responsibility. Contact us now about our Prom limo and Homecoming limo packages. Our Prom bus and Homecoming limousine and shuttle services will ensure your Prom limo and Prom party bus needs are met in and around Central Florida. Our Birthday Party limo and bus services will ensure your Birthday Party limo needs are Safely met in and around NYC and Long Island . There really is no better way to celebrate turning sweet sixteen than hiring a limousine to add a fun, extravagant, and exciting dimension to your birthday celebrations. The ultimate VIP ride for you and your BFFs. Hiring a limousine is a great way to ensure that your sixteenth birthday celebrations are memorable. After all, you only turn sixteen once! Whether you’re looking to arrive at your birthday party in style or you’re simply hiring a limo to explore the city, our luxurious fleet of spacious limousines and luxury vehicles will ensure that your ride has a VIP edge on this milestone birthday. Call Us Now 516-437-3826 for pricing information or fill out our Quote Form.